Driving to Milford PA after Shabbat I was dazzled by an enormous bronze-colored full moon. The moon is my most important partner in Jewish calendar matters. This moon was literally “in my face” reminding me that we are just two weeks away from Rosh Hashanah. Since the beginning of the Jewish month of Elul (two weeks ago) we are awakened during weekday morning prayer services by an eerie sound that fills our consciousness and then splits into several staccato strands, helping to shake and awaken our complacency, reminding us that the new year is fast approaching. The ram’s horn, the same shofar that will sound more than one hundred times on Rosh Hashanah, the same shofar sounds that filled the area around Mount Sinai when the Ten Commandments were given, is being blown on weekdays to call us to wakefulness. It is our daily reminder during this month that soon we will be called to stand before the One on High, ready to plead our case and ask for forgiveness and hopefully enter into the Book of Life. We are told by the sages that every person must prepare him/herself for thirty days beforehand with repentance, prayer and charity for the day when he/she will appear in judgment before the Holy Blessed One on Rosh Hashanah. The shofar sounds are our wake-up call to scrutinize our actions with a view to mending them, and spend time for introspection and self-evaluation. To be honest, I never truly expect a significant number of people to suddenly begin showing up at prayer minyans during the month of Elul. But there are other possibilities to fulfill the ancient imperative of becoming more self-aware during this time that are less traditional but worth considering. In his transformative volume This is Real and You Are Completely Unprepared, the late Rabbi Alan Lew (z’l) suggests that we simply choose one simple and fundamental aspect of our lives and commit ourselves to being totally conscious and honest about it for the 30 days before Elul. It could be something as simple as eating, or something about some aspect of your job that causes your stress. Perhaps thinking about eating might help you resolve to eat only when you are truly hungry, or to be mindful that there are hungry people who could use your help. You might want to contemplate what it is about your job that continues to keep you up at night and devise a strategy that might help improve the situation. Personally, the sounds of the shofar during Elul call me to reflect on promises or commitments that I made during the past year – especially those that I still need to fulfill. For the past 25 years our extended family vacation in Cape May has been a highlight of the year. It is a magical few days of family bonding, relaxation and tranquility. For the past two years I have had one of my dreams come true — leading Kabbalat Shabbat services on the beach, with the accompaniment of guitar, drums and melodica. At the end of the service more than 150 of us gathered in a circle, lit the Shabbat candles, and recited the Kiddush. Many people stayed after the service for more than an hour socializing and enjoying a potluck veggie Kiddush . I love praying out of doors, and the experience was made so much sweeter by the many faces of close friends in the crowd who came to join the experience. So as our hearts and minds turn to the new Jewish, school and work year, we need to get ready. If we do not, we will miss the opportunity that the High Holidays give us to change and start anew. If we do not prepare, we will not really be able to take advantage of these powerful days of reflection and re-orienting our lives. What is it that keeps you awake at night? Is it anger? Is it work? Is it food? Is it money? What do you want to do about it so that you will succeed in having more tranquil nights? What promises, obligations, and commitments did you make this past year that are yet to be fulfilled? The days of Elul are marching on, the shofar sounds call us each morning, and I imagine there is still much work we all need to do in order to be fully prepared and ready for the coming High Holy Days. Sometimes, it is easier or more satisfying to do this work in community. Perhaps you may want to consider attending a weekday morning prayer service to hear the sounds of the shofar for yourself. And if you have children, why not take them with you so that they too can be awakened to the sounds and think about what they want to do to prepare for the big days ahead? I wish you days of mindfulness, contemplation, awakening, and successful preparation! And good nights of sleep too! What makes a Rabbi happy? Whenever I perform for an audience of Yiddish speakers I like to sing and play the song Yoshke on my guitar. The song’s refrain describes how to make a rabbi happy: der rebbe haut gehasen freilach zein, trinken bronfen nit kein vine which roughly translates as “the rabbi will be happy if you never mix his brandy with wine.” I never mix brandy with my wine, so I do not know whether that will make me happier than I already am, or not. On the other hand, many things have given me enormous pleasure and satisfaction over the past 40 years of my rabbinic career — an uplifting prayer service, a Bar/Bat mitzvah student who exceled, family programs, our community joining in the celebration of the bris of our son on Rosh Hashanah, the publication of my first book, the accolades that came with winning numerous Solomon Schechter awards, and so many more. One of the things that has given me the most satisfaction over the years has been building our congregation’s highly successful Hebrew High program. Over the past few weeks I got some news that REALLY put a smile on my face. Four alumni of our own Hebrew High program will now be “paying it forward” and taking over the reins to (in their words) “re-Jew-venate” the program – two as co-directors and two as faculty members. This is not the first time that Hebrew High alumni have returned to teach in the program – which I count as a true measure of success! Years ago when a young child entered the classroom on the first day of school, he or she received a clean slate upon which letters of the Hebrew alphabet or a simple biblical verse had been written in honey. The child licked off the slate while reciting the name of each Hebrew letter and afterward snacked on treats of honey cake and apples. I still remember how when these four students were each in the third grade, they attended a breakfast with their parents. I spoke briefly to the class and invited each student to dip an animal cracker in honey and eat it. It was my way of symbolically wishing them a Jewish educational experience that would turn out to be tasty and sweet. In Judaism, the teacher-student relationship is sacred. I have always tried to instill the joy of Judaism in my students. I have encouraged them to see the world through Jewish eyes and to use their knowledge of Jewish texts and values to inform their decision making and their lives. To symbolize this, each year I presented our tenth grade confirmation students with special glasses that enabled them to see any light as a Jewish star (along with the congregation’s more traditional gift of a Tanakh so that the beauty and light of Judaism would guide their every step). The Talmud (Sanhedrin 19b) says that when a person teaches a child it is as if that person had created him/her. I am so proud to congratulate our congregation on their brilliant choice of our new Hebrew High co-directors and teachers. Our Hebrew High motto has always been “Get a Hebrew High.” Both Leora and I are on a high and take pride in letting everyone know how proud and happy we are that our students have now become teachers and educational leaders — in the very school in which they participated. We wish everyone a wonderful year of learning! I rushed over to see what excited Leora so much (thinking how odd it would be for this antique shop to have a mizrach). Much to my surprise she pointed to a road sign that had once hung on a post on the Garden State Parkway. 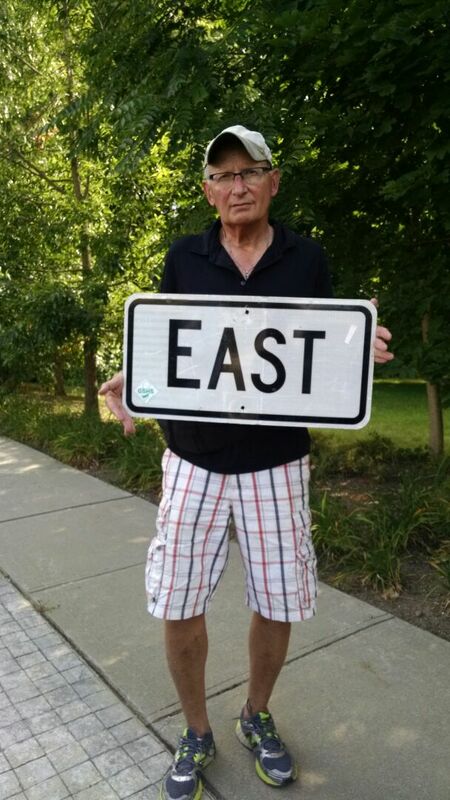 It simply read “EAST.” There it was—the most perfect of all mizrachs–no special design, no Hebrew, no fanfare, just the word EAST that reflects light at night. We knew we had to have it, and can hardly wait to display it on the eastern wall of our vacation home in the Poconos. If you don’t have a mizrach in your home you can purchase one online or from your local Sisterhood gift shop. Or, if you have artistic talent, you may want to create your own mizrach depicting a scene in Israel, a rising or setting sun, or a biblical verse such as “from the rising of the sun till the going down thereof, God’s name is to be praised” (Psalm 133:3) and mount it on one of the eastern walls in your home. Speaking of Israel, Leora and I are now designing the itinerary for our next group trip to Israel. We are planning a family experiential adventure leaving the last week of June 2017 that will be fun-filled and inspirational. More than 30 people have already expressed interest in learning more about the trip. If you would like more information, simply drop me an e mail (isaacsrl@gmail.com). We will be sure to send you information and invite you to an informational meeting. Although it may be apocryphal, one of my favorite quotes from Solomon Schechter, the first president of the Jewish Theological Seminary of America is “Gentlemen, in order to be a success in the American rabbinate, you must be able to talk baseball.” Baseball has always had a big place in my life. When I was a child growing up in Toronto my father would take me to see the Toronto Maple Leafs, the triple-A team of the New York Yankees. I immediately became a devoted Yankee fan, and delighted in the many successes of the team, watching them on television almost every week. In the early ‘50’s I began collecting baseball cards and memorabilia, and thankfully my mother never threw away any of my cards. I returned to the hobby in the 80’s when my son Zach arrived, and I was astounded to learn the value of my collection when I purchased baseball’s first price guide. For many years I went to baseball card shows and conventions with Zach to purchase and watch the wheeling and dealing of purchasers. I stood in line for 2 hours to get Mickey Mantle’s autograph. The Men’s Club of my Temple sponsored a number of baseball card shows, and I even have a personal letter on my Temple letterhead stationery from the late Bobby Thomson (“the shot heard round the world”) who spoke at one of our shows. I also started a “sub-collection” of Jewish baseball players. I couldn’t have been more delighted that my Temple chose a baseball stadium venue for my retirement celebration this past June. It was a magical afternoon. This past weekend I attended the world’s largest sports memorabilia convention that took place in Chicago. Once again, with my now-grown son Zach, we walked the large convention hall of dealers. I got to see some of my heroes of the past, including Pete Rose Jr., Reggie Jackson, and even had my picture taken with Zach and Cal Ripken Jr.
As those in Temple Sholom in Bridgewater (where I served as rabbi for 40 years) know, I have often used baseball themes in my High Holiday sermons and divrei Torah. As I see it, baseball has been a constant in an ever-changing American society. America has changed a great deal in the past hundred years, and although there have been changes in the game of baseball (with video replay, limited time allotted to pitchers between pitches, lowering of the pitcher’s mound, designated hitters and the like), the game is still basically much the same. Americans see baseball as being stable, something that reminds them of the past. It represents America values, all that we have ever seen as good, and that gives us a feeling of security. The timing of the start of the baseball season says it all. Funny how it often coincides with Passover, which is all about our birth as a nation with one focus—reaching the Promised Land (the World Series) and about coming from the evils of Egypt ( a dark, cold winter). And then there are my personal memories of seeing a Yankee game during Chol HaMoed Passover. While everyone else is feasting on soft pretzels and coke, I am munching a matzah and Passover soda. Ritual is a big part of Judaism, one of its building blocks. And so are its customs, actions accepted by much of the community, but have not (yet) achieved the status of law. For instance, does a congregation stand or sit when reciting the Shema? Is there a requirement for women to wear head coverings when in Temple? Baseball too has its many rituals. When losing the game, players often reverse their caps when a rally is needed. Batters often fiddle with their batting gloves in a certain manner each time they step to the plate. Many baseball purists do not want to see baseball change. They believe that one change leads to another, and once on the road of change, it cannot easily be stopped. Thus, they would want baseball to remain as it was for fear of seeing it become a game that they do not recognize. Many traditionalists in Judaism are also in favor of the status quo, fearing that change will diminish their Judaism. I have learned that meaningful change is good, both for baseball and certainly for Judaism. Remember that the original baseball players did not wear gloves, so you cannot say that baseball has not changed! And I think it has changed for the better. Similarly, who could have imagined women rabbis and cantors, and Kabbalat Shabbat services on the beach – changes that have so greatly enriched Judaism! We are told in the Jerusalem Talmud Kiddushin that we will be judged in the world to come by what we took the opportunity to enjoy and what we did not seek to enjoy. It was Rav who in that same text said that “a man will have a demerit in his record on judgement day for everything he beheld with his eyes and declined to enjoy.” And it is a character named Ray in one of my favorite movies Field of Dreams who has an opportunity to fulfil his dream, and sets out on his mission to build a baseball field. He definitely heeded the advice of Rav, for he had the opportunity to do something for everyone’s enjoyment, and did it, saying, “if we build it, they will come. “For if he did not, Ray would (according to Rav) be found wanting. This is the last place where Americans dream. Where everybody can learn the lessons of life. May we all take the opportunity to build our own Field of Dreams.